Is it possible to overlay an existing flat roof with Single Ply? Mostly the answer is yes, but each project should be taken on its own merits. The fact that a roof looks in good condition should not be the basis of installing a new roof covering. There have been many instances where new materials have been laid on old only to find that the roof deck has an inherent problem that requires a complete uplift and re-deck and re-roof. One of the problems with a flat roof is “Out of Sight and out of mind” and as a consequence building owners will invest more heavily on the interior than on the unseen roof. Most people only respond to a roofing issue when they see water entering the building. The first steps may be a cheap repair which holds the problem off for a short time until either that repair breaks down or further issues arise elsewhere on the roof. However, the day eventually arrives where investment in the roof area is of paramount importance. Upgrading this roof thermally will require a new layer of insulation in the region of 120 mm which will impact on abutment details. Even stripping back to the original roof deck may not give the required upstand height without modification to the abutment. The design of re-roofing specifications follows the same principles as that of new work, but there are added complications arising from the need to adapt, reuse or overlay existing materials. When renewing an existing roof consideration should be given to whether or not the thermal performance of the roof should be improved and the impact that may have on detail work, particularly abutments. The first course of action would be to carry out an inspection to determine the limiting factors which will influence the design and selection of materials. Before accessing the roof the question of whether it is safe to do so should be appraised. A number of issues can be identified from a suitable vantage point, ie from an overlooking window in the property, possibly from an external access tower or a properly secured ladder. If deemed sound then access to the roof can proceed. If the roof surface is self-finished then the condition of the existing materials should be fairly evident, obviously if covered by finishes such as mineral chippings, or masked by ponding then further steps to clear areas for inspection will be needed. 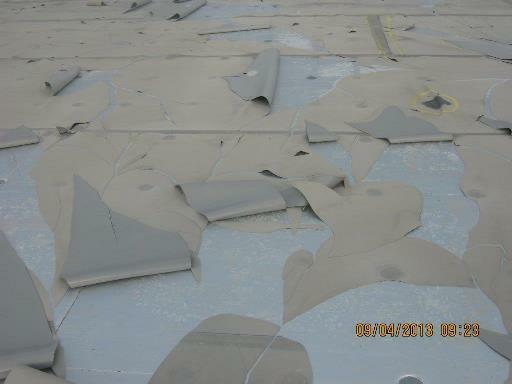 Depending on the type of roofing there are a number of defects that may be fairly evident. Splits or tears, physical damage, blistering, stresses in the surface, opening of seams/laps and advanced aging are all issues that could be contributing to a breakdown of the roof. 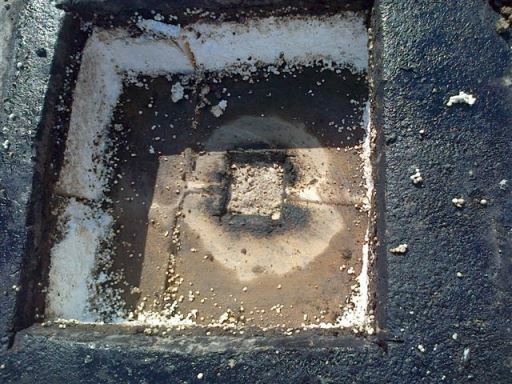 Any of the aforementioned issues should be fairly evident with Mastic Asphalt, Reinforced Bitumen Membranes, Standard Bitumen Membranes and Single Ply Polymeric Membranes. Again on self-finished surfaces, an undulated appearance may indicate that there have been some longer term issues affecting the roof build-up and structure. View of roof gained from window clearly shows complete failure of waterproofing and partial collapse of deck. Clearly a highly fragile deck that prohibits direct access. A roof being considered for future refurbishment is still in a good condition and suitable to be overlaid. 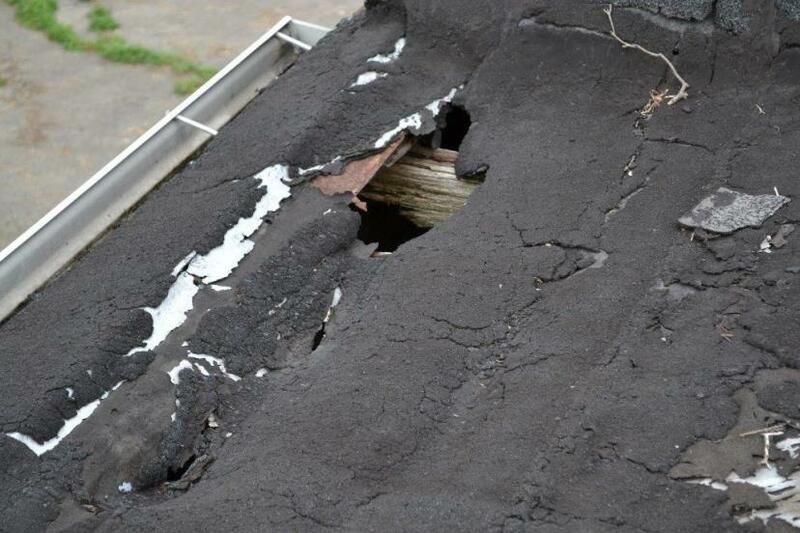 If the initial visual inspection indicates that the existing roof appears in good condition then a survey or robust inspection can be carried out. 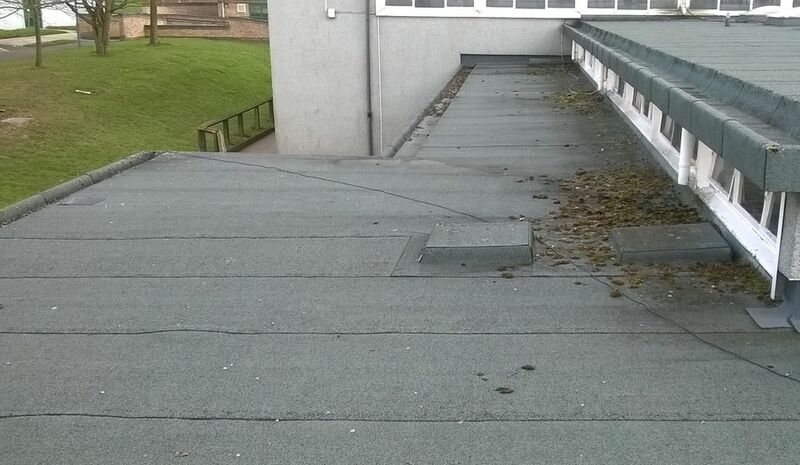 We would suggest that any such inspection is carried out by a competent person with flat roofing knowledge or skills. Today there are still many different qualities of bitumen membranes available from the very cheap and cheerful to the justifiably more expensive higher performance membranes: to convert the value of the last statement to life expectancy would be in the range of from 5 years to 40+ years. The shorter term products break down quickly and therefore would not be suitable to overlay particularly if adhering to. 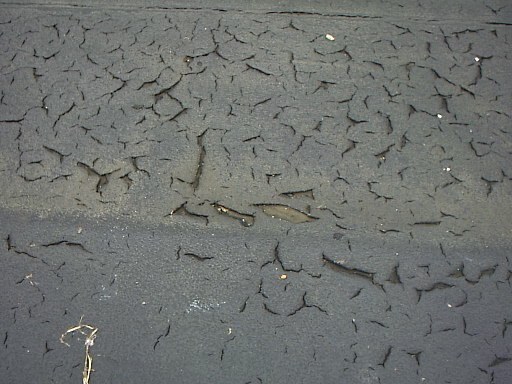 A flat roof that had been over-coated with a liquid based system which itself is breaking down, A bonded overlay would not be suitable although with some preparatory works a mechanically fastened overlay system might be an option. Core sample which revealed insulation was a tapered scheme; vapour control layer was damp. Deck found to be screed surface (Confirmed as concrete from internal inspection). In addition to the visual inspection it is also useful to carry out an intrusive inspection of the waterproofing build up. This can confirm number important factors such as; if the roof insulated from above, if so, what is the type and thickness of the insulation and is the insulation also a means to providing falls. An intrusive inspection also gives the opportunity to confirm moisture or water containment as well as confirming the roof deck structure. If moisture or water is found then further core samples should be taken to try and establish how widespread the problem may be. 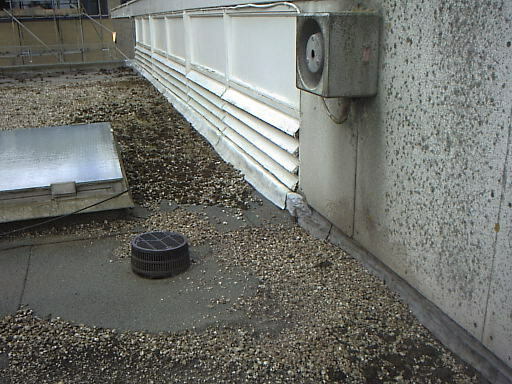 If extensive water contamination is found, it would be wise not to penetrate the vapour control layer as it may be preventing further damage to the roof deck and structure. Where the roof deck can be inspected the type and the condition can be appraised. Older deck types such as Chipboards and Stramit (Strawboard with paper facings) will most likely have outlived their structural stability and should be replaced. Both are susceptible to degradation if subjected to water contamination. Woodwool slabs were used in a variety of methods; plain boards with no edge reinforcement, boards with steel side edge reinforcement. There were also options for a pre-screeded type which carried a thin cementitious screed topping. Woodwool slabs were also used to fully over screed with a minimum 50mm screed thickness. Unless fully screeded, Woodwool slabs must be considered as a fragile roof deck. The inspection should also evaluate whether detailing is correctly designed and adjacent structures appear sound and weatherproof. An internal inspection is just as important as an external inspection; are there stains on the ceiling or the underside of the deck? If so, what is the extent of such tell-tale signs? Questioning the occupants on the history also helps paint a picture. The fact that ingress isn’t obvious internally doesn’t mean that water hasn’t been permeating through the system. Equally the internal conditions might have been contributing to an issue that may not have been detected to date. 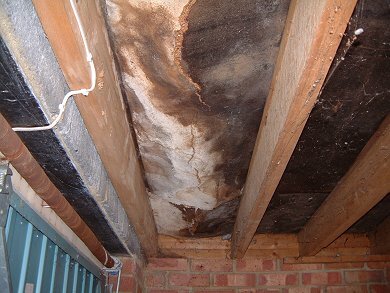 With a Cold Roof Design (ie the insulation is held in the ceiling void), problems can develop over long periods due to condensation build up and inadequate ventilation of the roof void. If, through core sampling, it is determined that the structure is a cold roof design then the existing ventilation provision should be explored and investigated further. If the survey provides a clean bill of health then there is no reason why the existing roofing cannot be retained and overlaid. The imposed loading of a new layer or layers to the roof must be taken into account and depending on the overall requirements of the proposed system, it would be prudent to consider sourcing advice from a structural engineer. Has poor detail design contributed to ingress problems? If a cold roof design, is it poorly ventilated? Are the internal conditions unbalanced? Is there entrapped moisture or water in the system? Is the roof deck formed with Chipboard or Stramit? Any of the above issues will need further investigation and possibly more in depth works such as corrective works and, most likely, to strip and replace the existing roof system. If the problem has been localised then, when required, repairs to the system and/or structure can be dealt with in isolation before embarking on the main task of overlaying. IKO Polymeric has a range of membranes that are lightweight and would be ideal for an overlay option. In addition we can provide assistance with roof condition surveys and give impartial advice on the options that would be available. For further assistance please contact IKO Polymeric’s Technical Team.